Today's professional library must be well prepared, multi-functional, space efficient and have an aesthetic appeal that blends well with modern and traditional environments. Franklin Mills case-style shelving is the finest furniture-grade steel case-type shelving system available. Our tough, double-wall construction protects stored materials and provides a "clean" professional appearance. Click here to view our case-style shelving brochure. Our intelligently and ergonomically designed case-style shelving is the system of choice for modern professional libraries. Offering incredible flexibility, you will be pleased with the ease with which our bookcase shelving adapts to any application. 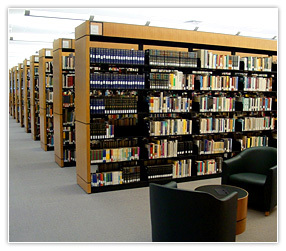 Contact the experts at Franklin Mills to discuss case-style shelving for your library at 1-888-678-4585.